Siri to recognize 'Her Master's Voice' in iOS 9.1? Siri, Apple's virtual, voice-activated personal assistant, happens to have a keener ear in iOS 9.1. Based on a look of the iOS 9.1 setup screen, Siri will apparently be able to discern between the voice belonging to an owner of a particular iPhone, and voices belonging to everyone else. While setting up the "Hey Siri" phrase that will activate the virtual assistant hands-free, the screen says that the setup process will "help Siri recognize your voice." If this is correct, the "Hey Siri" phrase will only work with a device owner's voice, preventing a stranger from activating the assistant on another person's iPhone. It also will eliminate Siri from being activated by your teasing friends, circling around you and your iPhone, mocking you by saying "Hey Siri" in an attempt to get your goat. The Apple iPhone 6s and Apple iPhone 6s Plus, when released starting on September 25th, will be the only two iPhone models that allow users to employ Siri's always-on feature while unplugged. Those using iOS 8 are able to call for Siri and activate the assistant hands-free, but only when their iPhone is plugged in. 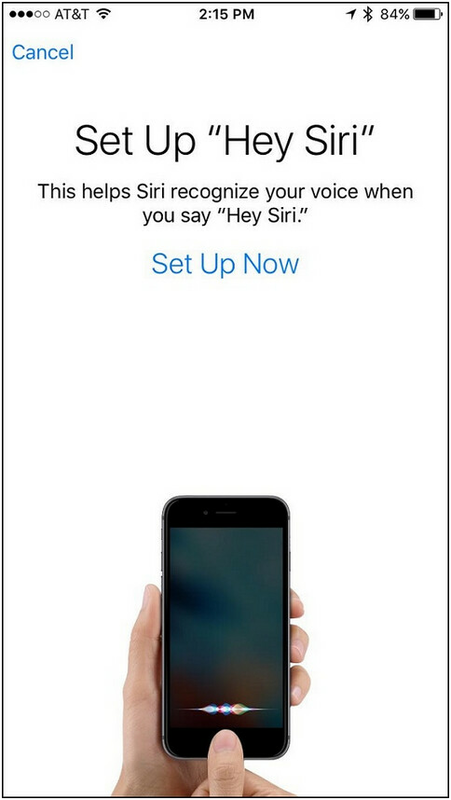 The new "Hey Siri" setup screen for iOS was discovered in the public beta for iOS 9.1, which was released on Thursday. Please have some scheduled articles on Saturdays and Sundays relating to tips, tricks etc. or re-post earlier Tips and Tricks. or anything else. Or have a blind Photo contest. I get bored to death on weekends by your website. Don't come to the website on weekends then, problem solved. You want those green thumbs though, hence post #1. :D One more thing, "or" follows a comma, not a period. Thank You Grammar Nazi. But Your comment about 'green thumbs' is a fail. P.S : I use Hacker Vision. So they appear purple here. Not to be needlessly contrary or anything, but since "etc." is an abreviation of "etcetera," it seems to me that his sentence structure is correct. It's like saying: "Turn right on Darkk Rd. or keep going straight until the round about." This is all assuming you're talking about the first "or" in his post. :) Back on topic, we can't expect the site to be bustling on Saturday and Sunday - it is the weekend after all. There's always a flood of new articles on Monday to make up for it anyway. will "help nsa recognize your voice." Your going to learn the benefit of app permissions later on when/if your phone gets android "M" in a year or two. Then come back and make an informative post regarding how iOS manages what your apps allowed or not allowed to do (that's real customization of OS - but you're probably content with changing icons and fonts). "To each his own" as they say, right? Is there an iOS app permission to block internet access? ha, ha, funny. But actually yes, you can block internet behind a password protection of you need to. Haha, going as far a lying through it's teeth just to defend it's divine Apple...congrats, you've cleared all doubts of you being an iSheep. I did t say it was in app permissions - have you tried the "restrictions menu", That's the one with a password that I was talking about (didn't know that you weren't so proficient in iOS - you act like you know so much, sorry) I'm not sure why you would want to restrict apps from accessing Internet - I would assume it's to save data, then yes you can also restrict cellular data to each app individually (it's one of the options among every other that any app is asking for). But once again, if you're worried about apps consuming data while in background - that doesn't happen for no reason on iOS. In case you missed it - it says "Use Cellular data - On/Off" Anything else I can help you with? Dude, come back to reality... The topic is about voice data stays on iPhone, he said what if it's "optimized" to be online, I meant that if you're paranoid about that - disable features you're paranoid about with app permissions! You started some jibber about disabling internet - I thought you were off topic, but showed you that there are options. then you got all specific on me. I wouldn't disable Siri because I rely on it way too much, and it feels backwards to do all these things manually when you have voice assistants like siri, cortana and google now. But for all intensive purposes - siri's voice training stays on the iphone - and your entire argument is based completely on a hypothetical scenario... If you disable siri, there's still the original voice commands that are improving more and more unnoticeably because the spotlight is on siri... Voice commands are all available offline - and I think that Apple should combine non-siri voice commands with siri - so that the voice assistant does not rely one internet for the littlest things, AND/OR automatically go into the offline mode when internet connection is too poor or none in that location. But you got some weird hard-on for proving some point about me defending apple and how it's "devine" of all things. I'm not defending squat, I just pointed out that a lot of your paranoia can be solved with app permissions - which will be available on Android "M" but will take much longer for most androids to get the update... If you want better answers - put in a little more detail in your comments... "Is there an iOS app permission to block internet access?" was your question, and I said yes, it's available in restrictions menu behind a password (for obvious reasons), but for every app there's a toggle to select if you dont want to "use cellular data" - I assumed you wanted to disable an apps ability to use up your data... Siri relies on internet connection because it uses Remote Servers to process commands - disabling internet for siri will disable her abilities after which you'll be using the voice commands available without the need for internet - thus if you're paranoid - you can be rest assured what you say stays on your phone only... (actually it wont even stay there, just execute and that's it)... I have no idea how to explain this to you with any more detail. If the NSA scares you, sell your phone and computer. And stop going to work. And stop hanging out with your friends. Those are all times where the NSA will listen to you. Are you a drug dealer or terrorist? Then I guess you have a justified reason to worry about the NSA. Yawwwnnn... Siri, please tell PA to recognize a boring weekend. telling apple to make it open source is like telling microsoft to make windows open source. Of course it does recongnize her master, it would be dumb to make always on voice commands so anyone could control your phone from behind. This is either going to work great, or hilariously bad.